Availability: This product is discontinued and no longer available for purchase. 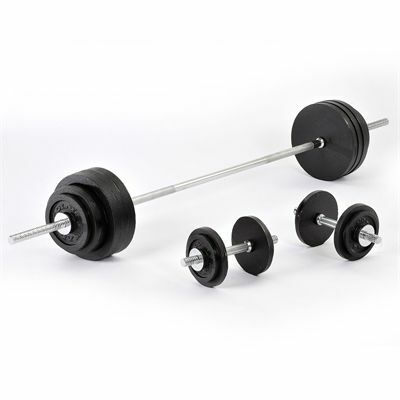 For alternatives browse our Barbells department. The Gold’s Gym standard hammertone weight set is manufactured from high quality cast iron providing supreme durability and sturdiness. It has a non-slip knurled hand grip area to ensure a secure grip and contains professional standard plates. The set includes 1 x 6’ (183cm) standard bar with 1” (25.4mm) diameter, 6 x ‘Spinlock’ collars, 2 x 14" (35.5cm) dumbbell handles, 4 x 5kg (11lbs) weight plates, 6 x 10kg (22lbs) weight plates, 6 x 2.5kg (5.5lbs) weight plates and 4 x 1.25kg (2.7lbs) weight plates. It weighs 110kg (242.5lbs) and comes with a 1 year labour warranty. for submitting product review about Golds Gym 110kg Cast Iron Barbell and Dumbbell Weight Set.